A Flying V? Nope, A Flying W! – Drowning in Guitars! A Flying V? Nope, A Flying W! Hey everyone, I recently took a trip down to DiPinto’s guitars in Philadelphia and I saw quite possibly the most unique, bizarre guitar I’ve ever seen! Chris DiPinto is the man behind the current DiPinto Guitar line. You can check out his site here and you can view his guitars for sale here. Chris is one of “us”, a true lover of oddball guitar designs! He’s also a really nice guy, and a top tier luthier. His guitar designs are amazing, and I’ll soon be profiling his Galaxie IV electric guitar. His guitars are the only current brand I like, and after talking and meeting with him, I just feel the need to spread the word! His early designs are hanging in his shop and they are just the coolest! OK, so getting back to the point of this whole post, Chris mentioned he had a very odd guitar that I just had to see. Well, after spending the morning appreciating Van Gogh at the Philly art museum, I was ready to appreciate some playable art. Check out these photos, and please excuse my fuzzy iPhone camera! 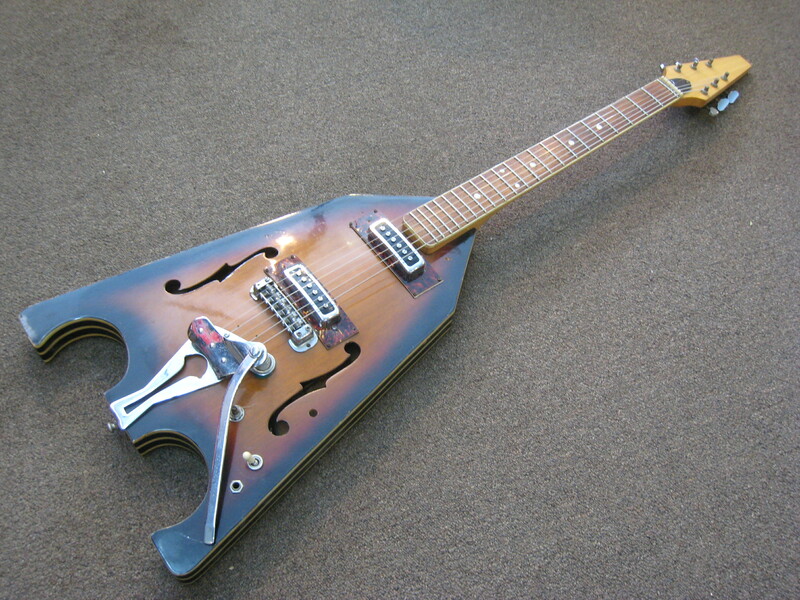 Check out this freaky guitar!!!! My goodness!! There have been a few changes along the way, but the overall design is what this guitar is all about! 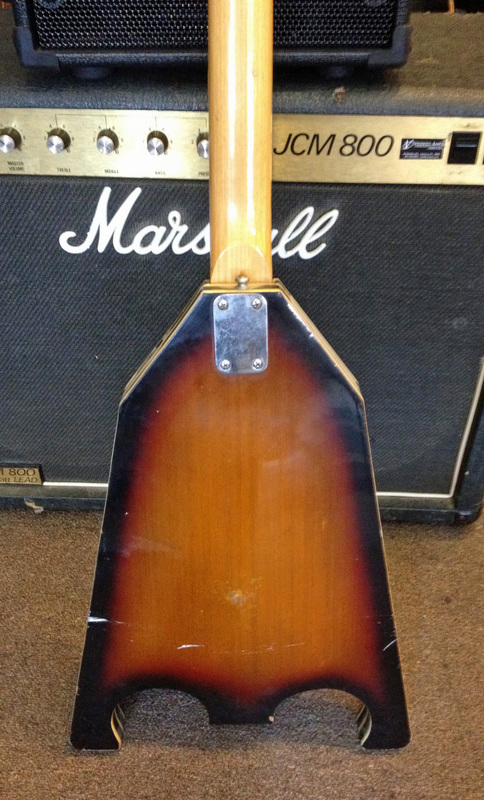 Check out that pointy headstock! And that body shape with the double cutaways on the bottom!! Good grief man! Chris pointed out that the tremolo isn’t original. Neither are the pickups, but the surrounds are original. The original pickups seemed to have a tortoiseshell inlay that matched the surrounds. Now this picture is a little more clear. One thing you probably don’t notice from the picture is that the back isn’t flat, it has a slight arch to it! Unreal! The neck plate has no writing, not even a tiny “Japan” stamped on there. That can sometimes mean Korean made, but this strange bird is definitely Japanese. The neck has a slight volute there, and the neck construction is laminate. A lot of signs here point to Kawai, but probably not made at the Kawai factory. I have my reasons why I feel this way, but mostly it’s just my intuition. I’ve been playing, fixing, and handling these vintage Japanese guitars for years, and sometimes I just have to trust my gut! But right here is the main reason I don’t think this was made at the Kawai factory. Check out the “rally” stripes! The only other guitars I’ve seen with these rally stripes were found on the late 1960s Kent guitar line! I have two of these Kent guitars and they both have the striping around the body edges. Those Kent guitars are sometimes found with the Kawai brand on the headstock (inlayed, no less), but just because the guitar says Kawai on the headstock, doesn’t necessarily mean that the guitars were made at the Kawai factory. I can’t say for sure, but it’s currently one of my ongoing research projects. So there you have it. If you’ve seen one of these guitars before, consider yourself lucky. I’ve been doing this for quite a while now, and I’ve never seen anything like this before! This is what I love about vintage guitar appreciation, there’s always something new to learn! And if anyone has one of these, please contact me! frankeroo at yahoo dot com.